Cup and saucer of hard-paste porcelain, in Chinese lacquer style. Painted in red and black enamels and gilded with Chinese figures in a landscape. The rims are encircled by a black border with a foliated wavy stem in gold. 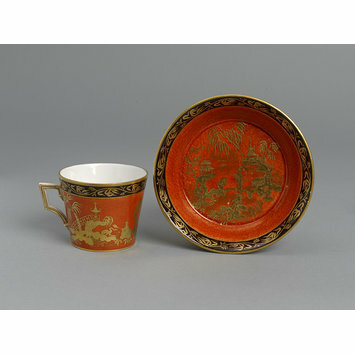 This cup and saucer painted with chinoiseries in gold on an enameled red background with black borders imitates the shape and decorations typical of Viennese porcelain of the Sorgenthal period which was used in Vienna staring around 1789 (TABAKOFF 2002, p. 108). 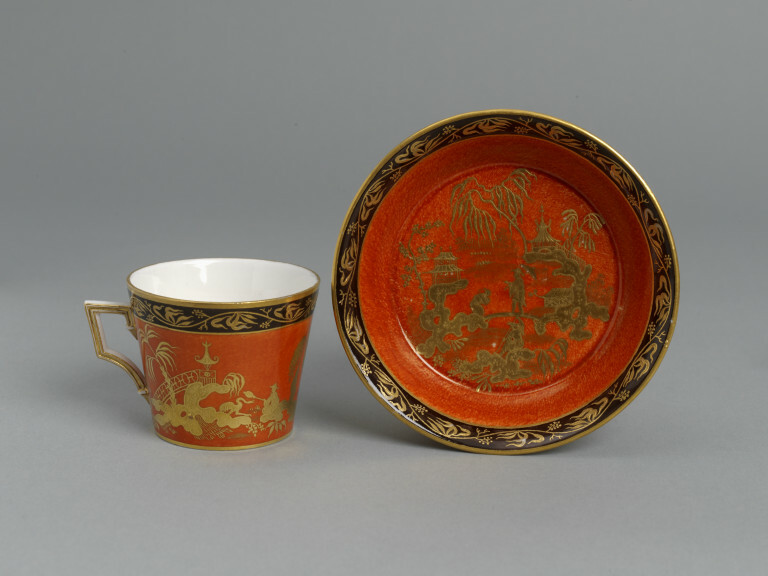 The decoration is derived from Chinese lacquer and at Vienna they used both the black and coral red grounds sometimes combined especially for the tête-à-tête tea sets. The sources for the chinoiseries, according to Sheila Tabakoff, are the prints made by the Nuremburg engraver Johann Cristoph Weigel based on models by Petrus Schenk, or else the illustrations from A Treatise of Japanning and Varnishing by John Stalker and George Parker, published in London in 1688. The tapered shape of the cup was used for the first time at Sèvres and catalogued as “gobelet à cerceaux” or “gobelet de la reine”. At Vienna it was paired with saucers that had a ring in the centre to hold the cup. This type of saucer was defined by Folnesics and Braun (1907, p. 70) who were the first ones to catalogue it, as “for chocolate”. At Doccia, the shape appears in the first quarter of the 19th century with decorations that are typically neoclassical (LIVERANI 1967, plate CIII). It is highly likely that this cup and saucer is a copy of a Viennese original that was formerly in the collection of the grand dukes of Tuscany; during the reign of Peter Leopold and Ferdinand III of Hapsburg Lorraine, many Viennese porcelains were added to the collection.